This summer, HeartCry sent Gennady Mikhailov and Sergey Mochalov to visit churches in the Yakutia Republic – a region in the Far Eastern District of Siberia almost the size of India with a population of one million people. The following is part one of Gennady’s report of the trip. I thank the Lord for His blessings during our trip to Yakutia, which my brother Sergey and I took last month. Our God arranged and provided everything. We were in Yakutsk (the capital city of Yakutia) for eight days, and in Srednekolymsk for ten days. Concerning our stay in Yakutsk, I must first give a little background information. In the Yakutia Republic there exists a certain association of churches, which consists of about thirty churches across the region. Five of these churches, which are also the largest, are in the capital city of Yakutsk itself, and one of them is a national church (the services are conducted in the Yakut language). Unfortunately, all of these churches today are dominated by man-centered teachings and have no clear biblical doctrine. The leaders of this association speak of doctrine as a big buffet, where everyone should be able to get exactly what he likes according to his own tastes. They not only misunderstand the biblical doctrine of salvation by grace, but more than that, they actively reject it. It is no wonder then that many people in these churches gladly proclaim to be Christian but still remain in their sins and vices. Moreover, they are open to various heresies and demonic teachings. I have to confess that when we found out about the specifics of the different teachings, we were shocked. During my years in ministry I have seen a lot, but here I was shocked by the ease with which such demonic teachings enter the church. What is more, these teachings enter not through church members, but through church pastors. Moreover, all those in churches who disagree with the association’s views are under considerable pressure, even to the point of excommunication. It is for this reason that the Yakut association split. Some churches have expressed their disagreement with the views of the association leadership and left. This is what happened with the fourth Baptist church in Yakutsk – half of the church left the association and became an autonomous church. It was at this church where we spent our time during our visit. 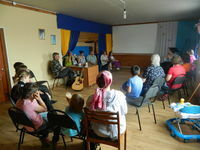 The pastor of this church is Andrey, who is 40 years old, married and has three children. He came to faith in God in 2007 while he was imprisoned in one of the Yakutsk prisons. There he suffered from open tuberculosis and was in a hopeless condition. Prison doctors refused to treat him and left him to die. He cried out to God in desperation, and God heard and answered him. God both saved his soul and healed his body – two wonderful miracles that display the unlimited power of God! Some time ago, Andrey, in order to protect his church from the association’s influence, cancelled legal state registration of the church, causing much anger from the association leadership, and because of that he was excommunicated by them. He was also the one who openly expressed his disagreement with the unbiblical teachings. He and other church members, who also disagreed with the association, left and built their own church building, where they are gathering now. The main problem of this church, that we immediately saw, was the poor knowledge and understanding of God’s Word. However, all of the believers, including Pastor Andrey himself, were open to the teaching of God’s Word. During our time there, we had many opportunities to meet and talk with individual church members, as well as together with the whole church. All of this made a good impression on us. We noticed that they were willing to learn, willing to grow in the knowledge of Christ, and willing to humble their souls. We were very pleased that all of them were very serious about the doctrine of salvation by grace. I can say with confidence, that Sergey and I love them! We feel that the work with them should be continued. For now, all this can be done through conferences and occasional visits to the church. They are a needy group that is hungry to learn and grow in the Lord. Therefore, remember this church in your prayers, and pray especially for their pastor Andrey, that God would help him to grow and mature rapidly in the Lord. Prior to our arrival, he was in some depression from what had all transpired, but our visit encouraged him. Now he is once again eager to serve the Lord. May God bless and guide him.